It's not Halloween time without the annual Treehouse of Horror episodes from The Simpsons! 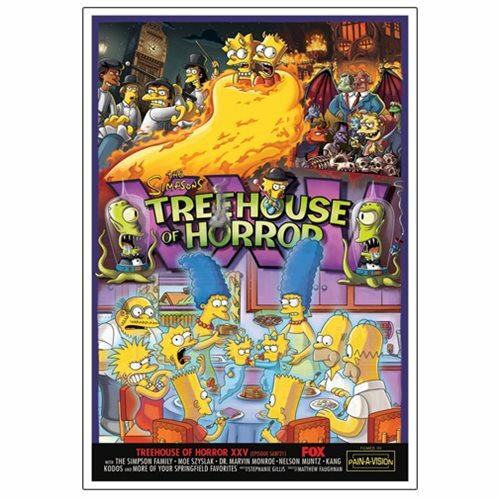 Containing some of the best moments throughout the animated television series' long run, you can now bring the fun of Treehouse of Horror home with The Simpsons Treehouse of Horror XXV Canvas Giclee Print! Inspired by the Season 26 episode, "Treehouse of Horror XXV," this piece features scenes from all three segments: "School Is Hell," "A Clockwork Yellow" and "The Others." A limited edition of 50 hand-numbered pieces printed on canvas, this beautiful piece of art measures 28-inches tall x 20-inches wide and comes complete with a certificate of authenticity!